The volleyball team meets with Head Coach Danielle Kohut prior to the game. 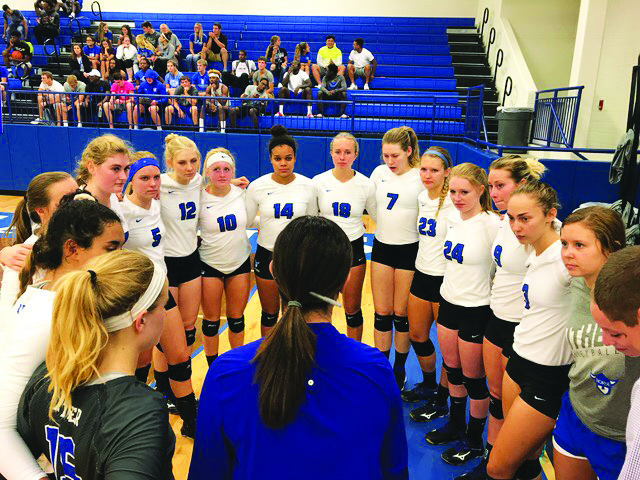 Women’s volleyball played their first Iowa Conference game of the season against University of Dubuque on Sept. 13. This was the team’s first chance to showcase their hard work and preparation prior to the start of the season. Luther beat the University of Wisconsin at Whitewater, who is currently ranked 11 in the nation. After the UW-Whitewater game, which was a turning point for the Luther team, Kohut said her players learned what it takes to beat a good team. Chemistry between the players on and off the court aided in the successful game. Before going into Wednesday’s game, team captain Nicki Ellingson (‘18) echoed her coach’s sentiments. “[Playing} Whitewater this past weekend was a big push for us,” Ellingson said. Ellingson added that they have to carry that energy onto the University of Dubuque game and the rest of the season. After five sets, Dubuque remained undefeated, ending the match in a 3-2 score. The Dubuque Spartans won the first set 25-21 and the Norse came back in the next two sets, posting 25-20 and 25-22 set victories. In the fourth set, Dubuque evened out the match posting 25-15 and won 15-9 in the deciding set. Several players totaled double-digit kills in the match. Sophomore Karissa Kime (‘20) led the team with 14 kills. Kime explained how the team will continue to progress after the loss. Anna Larson (‘19) and Emma Veum (‘19) followed Kime in kills tallied, both with 11 and Sam Schroeder (‘21) with 10. Sam Sixta (‘20) had 43 assists, and Larson led the defensive efforts with 22 digs. Morgan Towne (‘20) recorded nine kills with no errors. Coach Kohut is excited about opportunities for junior varsity women to play in the near future and is optimistic about their chances on the court. Kohut has seen her entire team make progress the past three weeks. On Friday, Sept. 15, the team bounced back from their loss with a win over the number 21 nationally ranked team, University of Wisconsin at La Crosse. As the season continues, she is hopeful they will maintain their momentum.